Decades ago, the location of the waterfall in the eastern part of the island of Morotai, North Maluku, just a regular a little heavy stream river, in which there is a waterfall. Today, a large family in the village of Mira, District East Morotai, want to develop it as a tourist location waterfall named Bunga Kokota. 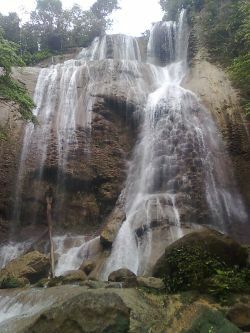 Bunga Waterfall located on the slopes of Mount Bakulu, precisely in the eastern part of the island of Morotai. Despite, this tourist location is not yet able to compete with other tourist sites in the archipelago waterfalls. However, the Bunga Kokota waterfall has natural beauty about that you can visit during surface interfall. The surrounding neighborhood is still very natural, remains untouched and far from damage caused by human activities. Water falling from a height of ferocious rocks was very refreshing. The travelers who have visited the Bunga Kokota Falls complacent with the natural atmosphere at this location.